Generalised boycotts are often cited as effective weapons to give solidarity and fight oppression. Quite often the boycott movement against South Africa is cited as proof of that. But let’s look at the interpretation and use of the boycott weapon by the Anti-Apartheid Movement (AAM). At times prior to the early 80s I was involved in that movement. However this article will primarily focus on the work that a number of us did in solidarity with the black trade union movement that arose after 1979. Work that led us to be in a sharp argument with both the AAM and the ANC and their demand for a total boycott. The boycott of South Africa that AAM called for from 1962 was multi-faceted. It followed the banning of the ANC, the ANC advocacy of a guerrilla struggle and forsaking the possibility of using any institution legally possible within the apartheid regime against itself. Boycotts were called against South African companies profiting from the super-exploitation of black workers who, under apartheid, were denied equal rights and whose main political organisation, the ANC, had been banned. The only recognised unions, replicated wider society’s inequalities to its black members. Throughout the rest of South African society, there was both segregation and huge inequalities. Black workers in the cities had to live in ‘townships’, segregated slums in the suburbs. The townships were brutally repressed by the South African police. On a number of occasions there were massacres when those townships erupted in protest against such things as the restrictions on their free movement using the ‘pass laws’, triggering the massacre at Sharpville in 1960, or in protest at inequalities in education as the student protests led to the massacre at Soweto in 1976. Apartheid as a formal policy was adopted in 1948, later in its squalid history it attempted to accelerate the promotion of bantustans which it would argue were the ‘homelands’ of the black workers in the townships. In this way it hoped to undermine the claims of black people for equal citizenship within South Africa. They would all become migrants from another ‘country’ which they may never have even seen – migrants in their own land. The boycott that the Anti-Apartheid movement developed was more than a consumer and business boycott. It stretched to sporting events, relationships with musicians and any relationship with any civil organisation. The boycott in sport essentially took off when the South Africa cricketing authority declared that it would not let Basil D’Oliviera play in the England team in South Africa as he was by their description ‘coloured’ – he had emigrated to Britain from South Africa. British activists campaigned for the MCC (the body that selects the England team) to refuse to remove D’Oliviera from the team – a demand that was initially refused. Very soon, the demand was raised that all sport organisations outside of South Africa should never play in a society where sport was segregated at every level. The demonstrations in 1969 against the Springbok (South Africa’s rugby team) tour was the starting point for Anti-Apartheid as any sort of mass movement. Peter Hain then in the Young Liberals was prominent. The demonstrations were pretty viciously policed – I watched a friend get his teeth knocked out at one. Another focus of the boycott campaign was Barclays Bank – which had extensive operations in South Africa. 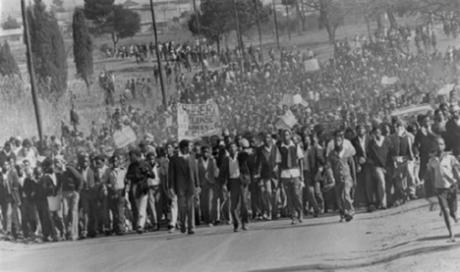 Students were prominent in opposing apartheid. Generally, but particularly back in the 60s, 70s and 80s, people chose their banks once and didn’t move from it all their lives. So that particular boycott had some effect and concerned the owners of Barclays. But elsewhere, whilst giving activists something to do, was ineffective. Whilst some of the boycott actions were generally popular and effective in showing the nature of South African society and organising against it, some proved pretty disastrous. The boycott of artistic performances in South Africa made some sense. Entertainers and artists were encouraged not to play at the leisure complex, Sun City, a huge whites-only resort. A song was written and played by Little Stevie, a member of Bruce Springsteen’s band, and others “we ain’t going to play Sun City”. No-one could deny that such a boycott of the perks of the privileged white minority was justified nor that the performers should be condemned for their involvement in such clearly racially segregated events. Anti-apartheid however embarrassed itself with at least a couple of these. The folk singer, Paul Simon had developed a musical relationship with the black South African choir Ladysmith Black Mambazo. He was criticised by the UK anti-apartheid movement for this. Jerry Dammers, formerly of the Specials, and writer of the song “Free Nelson Mandela” was prominent in these criticisms. However, emigre black South African musicians Hugh Masekela and Miriam Makeba – who were both well-renowned for not only their musicianship but also their opposition to South Africa and their support at the time for the ANC – supported Paul Simon. They did a UK tour along Paul Simon and Ladysmith. But from a socialist point of view the stupidity of the Anti-Apartheid Movements policy of blanket boycott was shown in their treatment of the black trade union movement in South Africa that rapidly developed after 1979. That movement was initially, and for most of its history prior to the overthrow of apartheid, opposed by both the ANC and the UK AAM – who argued that trade unions set up within apartheid South Africa could only be collaborators. The black trade unions were initially illegal and always faced legal attacks. But when they were successful in organising in the factories and the townships, they forced the bosses and the state to give them legal recognition. There was a famous strike that one of those unions, MAWU, organised that impacted on the UK- the strike of workers at the Sarmcol factory, part of the British company BTR that also owned an array of other subsidiaries in the UK. The strike had been on for a year when the union decided to send representatives of them in 1986 to the UK to ask for support and solidarity. So important was the issue of solidarity considered to be by MAWU that they sent their General Secretary over, Moses Mayekiso. Prior to him coming over, Moses had taken a lead role in establishing elements of direct autonomy in the black township Alexandra on the outskirts of Johannesburg. In the mid 80s, there were ongoing revolts in most of the black townships, particularly around Jo’burg. Alexandra, where Mayekiso was a leading figure, was effectively a no-go area for the apartheid police after they killed dozens after a funeral that developed into a protest in February 1986 – instead the residents, largely organised through their unions policed the township, had their own peoples courts etc. On Moses’ return to South Africa, although this was not known when he was here, he was arrested on a treason charge for his role in the revolt in Alexandra and faced the death penalty. Moses was no collaborator with apartheid! However when he came over here, the Anti-Apartheid Movement advised trade unions not to meet or greet him, Moses was in fact stopped by the UK Immigration authorities from getting into the country. However there was a network of trade unionists of which I was a part, that believed that direct links and solidarity were essential between the new black trade union movement in South Africa and elsewhere. We argued that worker-organised and targeted boycotts of companies in South Africa could be effective in fighting the super-exploitation of black workers in South Africa. It was a few of us, in that network of trade unionists, who had planned Moses first stop in the UK in Nottingham. We had planned for Moses to talk to workers in Raleigh, part of BTR, as well as trade unionists and anti-racists at a meeting being sponsored by Nottingham Trades Union Council. It fell to myself and Steve Battlemuch, on the Trades Council Executive at the time, to ring up MPs to get them to speak up on Mayekiso’s behalf. At those times if a number of MPs were prepared to vouch for the authenticity of a visitor to the UK , Immigration Officers had to back down and let them in. One might have expected that the resources of the Anti-Apartheid Movement, which had very widespread support in British trade unions, might want to be leading such actions in support of black workers and their leaders. But AAM continued to not co-operate with Mayekiso, the Sarmcol strikers, MAWU and their union federation of the time FOSATU for another 2 years. Eventually FOSATU renamed itself, replacing the first letter F that stood for Federation and replaced it with a C, for Congress. This renaming was done after coalescing with a number of other smaller unions. This concession on FOSATU’s side, nominally becoming a part of the ‘Congress’ movement was the face-saver that allowed the African National Congress to reverse its policy and lift any boycotting of the new black trade union movement. In reality the ANC to retain any credibility had to recognise not only the huge battles that had been conducted by miners and other trade unionists but also the massive blow, those struggles had given to apartheid. Some of us, myself included, would argue that those struggles were in fact the killer blow. But many people have the mistaken belief that it was a generalised boycott of all South African bodies, be they social, cultural, sporting or even working class movements, that brought down the apartheid regime in South Africa. It wasn’t. It was mass action by black workers in the townships and the factories organised by unions like MAWU as mentioned above in Alexandra township. As always it is the democratic indigenous mass struggles of people, using working class methods of struggle whenever they can, that is the best weapon against oppression. Even with the consumer boycott, it was workplace organisation that proved most effective, even when small, as with the refusal of retail workers to handle South Africa goods in the Dunne supermarkets in Ireland. Sporting and cultural boycotts meaningfully targeted on the bodies that were clearly acquiescent in the racism of the South African regime had their part to play in maintaining the movement of opposition to apartheid. But boycotts that were only motivated by the argument – that if you hate apartheid South Africa you had to boycott everything South African – were crude, often unproductive and as they were with the new black trade union movement positively harmful. The same hold with moves to boycott everything Israeli. The situation in Israel is, of course, different from what it was in South Africa with different boycotts having different value. In Israel there is considerable racist exploitation of migrant workers as elsewhere in the world. But the Israeli economy does not survive on the organised super-exploitation of Palestinian workers as the South African economy did with black workers. The racism of Israeli society is shown primarily in its exclusion and expulsion of Palestinians rather than their capitalist super-exploitation. In South Africa whites went into the engineering factories and mines either as bosses or very privileged workers, whilst black workers went in those same workplaces as oppressed workers without civil rights and, for most of apartheid’s history, without the right to be in an independent trade union. No doubt, there is similar racial stratification in workplaces in parts of Israel (and in the UK). But such racist stratification was the very basis of the apartheid regime in South Africa. It is not the basis of the Israeli regime. The Israeli identity is therefore very different from the white South African identity. All through its history there have been powerful oppositions within Israel to the state-sponsored racism to Palestinians, at various times working class and socialist-inspired at other times liberal bourgeois. Any boycott movement in solidarity with the Palestinians would need to recognise the political and class differentiation in Israel – focus on the expansionist activities, on the military machine, develop relationships with Israeli opponents of occupation and use the working class movement in the UK and elsewhere wherever possible. But a generalised boycott against all Israeli organisations or produce, especially one that might be perceived as anti-Jewish rather than anti-Israeli, would aid the argument of the Israeli right wing government – that the solidarity movement in support of Palestinians shares Hamas’s hostility to all Jews as a people. This entry was posted in Israel/Palestine on August 6, 2014 by Pete Radcliff. Are Hamas preparing a new wave of suicide bombings in response to Gaza atrocities? There was a report yesterday from Gershon Baskin that Hamas were ready to send 3,000 suicide bombers into Israel and they had said goodbye to their families. His report was predictably picked up by some of the right-wing Israeli press to justify the present onslaught on Gaza. Although this was clearly not Baskin’s intent with this report. He had been earlier involved as an intermediary during negotiations with Hamas and then exposed the Israeli government for sabotaging those negotiations by assassinating the senior Hamas official he was negotiating with! So what do we make of this report? Baskin obviously hoped it would pressurise the Israeli government to back off from their assault on Gaza. He has frequently spoken against it as well as the occupation generally. Although he is someone who, given Hamas’s unwillingness to negotiate, is trying to get a reasonable peace treaty between Arab states and Israel – which I believe Netanyahu will never accept. But is his report true, likely or even possible? It would be a terrifying prospect if it were true or possible. Not only because of the human carnage and suffering that would be caused. But also because a string of successful suicide bombings across Israel would provide the Israeli govt with an excuse for the assault on Gaza. It could even cause a wider war, with even greater ferocity, on Palestinians. Is it possible? Well Hamas’s rocket stocks are undoubtedly getting depleted and the possibility of using the tunnels for military purposes are diminishing. But with the slaughter going on in Gaza, there are undoubtedly thousands of young Gazans further traumatised by the carnage and wanting to avenge the deaths of their family. One would hope that they would understand that Hamas has given the Israeli govt the pretext for its invasion, bombardment and blockade – that Hamas’s racism towards Israelis should be dispensed with and an alternative route pursued. One could hope – but how likely is that in Gaza where the possibilities of debate and discussion are so reduced by war. So, yes I believe it would be possible. But it is the logic of Israel’s war on Gaza as well as Hamas’s war on Israel. That is why we have to oppose both wars – and unilaterally on each side we should call for the end of offensive action. If Israel can be made to stop, at least there would be some time to allow Gazans to persuade and pull back anyone mobilised by Hamas for a new wave of suicide bombings. Is it likely to happen? In reality the vast majority of those bombers would not get through given the extent of Israeli security nowadays. But even the posture and any declaration of a revival of the suicide bombing strategy by Hamas would give the Israeli govt the excuse for even greater persecution of Palestinian and Israeli Arabs. Nothing can be gained for long term peace and justice, on either side, by this bloody war on Gazan civilians nor even the posturing, never mind the reality, of a further war by Hamas on Israeli civilians. This entry was posted in Islamism, Israel/Palestine, war on August 3, 2014 by Pete Radcliff.